Help! I Have a Headache! It’s happened to all of us before. Maybe you’re watching television or eating at a restaurant or working hard at the office, when out of nowhere a headache sets in. Why is this happening to you? There are several different causes for headaches, but when you’re in the middle of a busy day, it’s not the why that matters as much as the how can I get rid of it?! FastMed recommends trying these strategies for headache relief. One of the most common reasons people get headaches is because they’re dehydrated. Even if this isn’t what’s causing your headache, it certainly won’t do you any harm to get more water into your system. Head to the sink, fridge, drinking fountain, or water cooler and pour yourself a nice, tall glass of water. Skip the ice, though; research has found that drinking ice-cold water can increase blood flow to the anterior cerebral artery, which can exacerbate the headache. Many of our professional and leisure activities revolve around screens, whether it’s the computer or the television. Too much screen time strains your eyes and can lead to a headache. If you get hit by a headache, see if you can remember the last time you got up, stretched your legs, and walked around. If it was more than an hour ago, it’s been too long. You can also get headaches from poor sitting posture, so taking a break is an anti-headache double whammy. If you can’t get away from your screen, buy an antiglare shield or put on a pair of sunglasses. You may not be the coolest-looking guy in the office, but at least you’ll have fewer headaches. 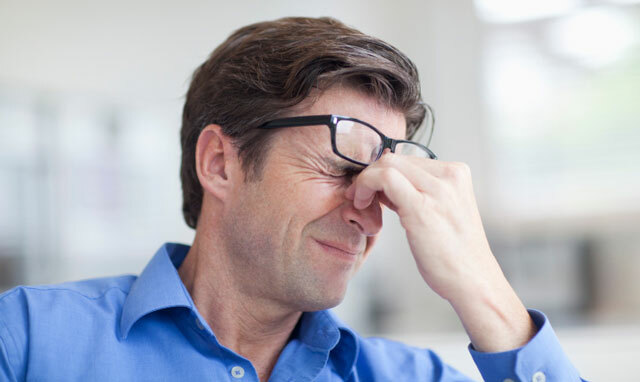 Low blood sugar, or hypoglycemia, can cause headaches. That’s not an excuse to reach for the nearest candy bar, though. Instead, eat an apple, peach, pear or other kind of fruit. These are high in fructose, which is an unprocessed, healthier sugar than the kind you’d find in a candy bar. Pay attention to how frequently you’re eating; it can be easy for the hours to fly by when you are absorbed in a task. Ideally, you should eat several small, healthy snacks every few hours. This is another one-two punch for your headache. Tension headaches, or stress headaches, are the most common type of headache among adults. As the name implies, these can be induced by high levels of stress. If you feel a headache coming on, take some time out for yourself. Make a cup of tea and relax for ten or fifteen minutes (away from the computer screen). In the long run, you’ll be more productive by getting rid of the headache than you will be if you try to work through it. Plus, many teas are caffeinated, which can help relieve headache symptoms as well. If you find that you have recurring headaches, headaches that last for more than a day, or pain that radiates down your neck and shoulders, you may want to see a doctor at your local FastMed Urgent Care. He or she can help figure out the source of your headache, and work with you to find ways to alleviate the pain, including over-the-counter or prescription medications. We’re open 365 days a year, 7 days a week, so stop by any time!